Don’t have a spare room to convert for your home office? No worries! There are plenty of ways to create a great home office when you don’t have a lot of space to work with. Here’s how you can create your dream workspace with limited square footage. A home office doesn’t need to be big, but it should be located in an out-of-the-way spot where you won’t be easily distracted. Living rooms, bedrooms, and kitchens are a poor choice, but a finished attic or basement, dining room, large laundry room, or walk-in closet you’re not using could be the perfect location. If you’re up for renovating, transform unused space into a full-fledged office by adding interior walls to a family room or dining area that’s larger than you need. You could even convert part of a garage or outbuilding into a finished office so you have workspace that’s completely separate from your home. Working from home has its perks, but it’s tough to be productive in your own house. With flooring, insulation, heating and cooling, and a few other touches, you can convert your garage into a comfortable workspace. Don’t have a suitable garage to convert? A prefab steel garage is a great way to get your home office up and running without cutting into your living quarters. Plus, a ready-made office can be erected quickly and without spending a fortune. What type of look do you want for your home office? The answer to this question will determine what kind of furnishings you shop for. If you like the traditional executive look, a wooden desk in a dark finish and a plush leather office chair will get you there. Prefer something modern and techy? Look for light colors, slim profiles, and minimalist décor. If you’re a creative professional, decorate your office nook with fun wallpaper, a unique chair, and plenty of space for vision boarding. Do you really have no space for a home office? A fold-away wall desk lets you create a workspace when you need it and hide it when you don’t. Remember: If your home office is out in the open, its style should match the overall look of your home. Otherwise, the office space will stick out. You need an office computer that’s dedicated solely to work, not Netflix, your children’s homework, and everything in between. Letting your work computer be used as a multipurpose device puts your important business data at risk. If you don’t already own an office computer, use Staples’ buying guide to select the right system for your work. Need a dedicated phone like for your home-based business? Paying for a landline isn’t your only choice. You can go mobile and get a work cell phone, use VoIP, or use Google Voice for free calling over your internet connection. Money Crashers explains the pros and cons of each option to help you choose. A home office is more than a desk and a chair. You also need space for all your important documents, business mail, and other office essentials. Without adequate storage, your desk quickly turns into a cluttered mess that hurts your productivity. Floating shelves are ideal for storing books, binders, and filing drawers without limiting floor space. For office accessories like pens and paper clips, a pegboard wall with mounted bins offers clutter-free access. If you want to add personal touches or a bit of inspiration, a cork board mounted on the wall is the perfect solution for family photos, motivational quotes, and notes-to-self. You can assemble everything yourself or buy a modular storage system that fits it all together in one sleek setup. 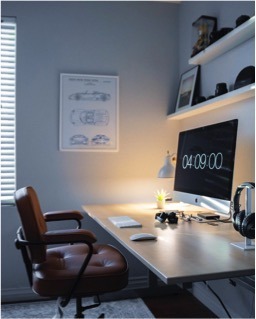 Designing a home office is an opportunity to break free from the boring cubicle and inject personal flair into your workspace — that’s true whether you’re working with a whole garage or just a corner of a room! Instead of thinking of your small square footage as limiting, view it as a challenge to create maximum function and style in minimum space. This guest blog post is provided by Tidy Home.